11th International Brač summer carnival will be held from 14.09.-18.09. on island of Brač. 14.09. Friday at 20:00 Carnival charity night in Bol. 15.09. Saturday at 20:00 International carnival parade in Supetar. 16.09. Sunday at 20:00 International carnival parade in Bol. 17.09. 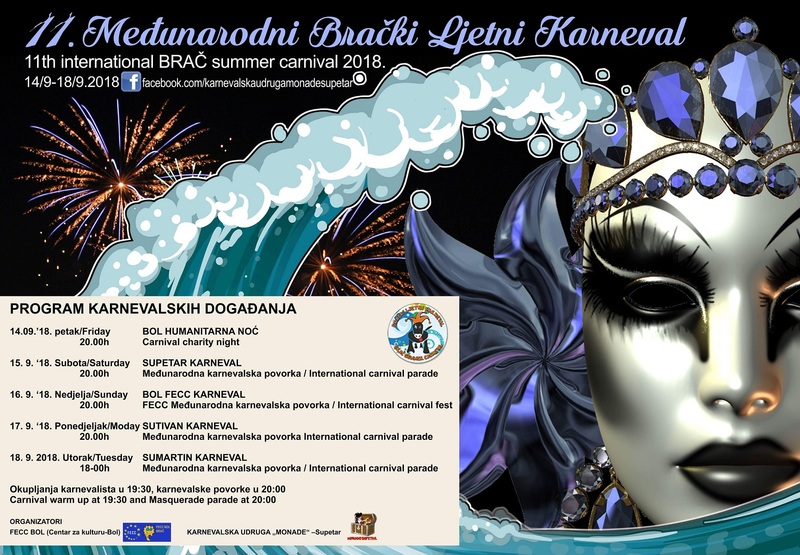 Monday at 20:00 International carnival parade in Sutivan. 18.09. Tuesday at 20:00 International carnival parade in Sumartin. More information on facebook page. Addresse: Porat bolskih pomoraca b.b.